Who is Head Above Water? Head Above Water was started by a group of mates from Sydney’s Northern Beaches who’ve been touched by the negative effects of poor mental health. The rate of suicide on the beaches is significantly high. That, coupled with the national rate of suicide rising, has been the inspiration for Head Above Water to take action. The name is a reflection of the need to implement exercise as a key strategy that ontributes to positive mental health and an overall sense of well-being. For our first event, the Head Above Water 24 Hour Swimathon, all our fundraising efforts will help Gotcha4Life and the mental health initiatives they support. What is the Head Above Water 24 Hour Swimathon? Our Head Above Water 24 Hour Swimathon is just that. 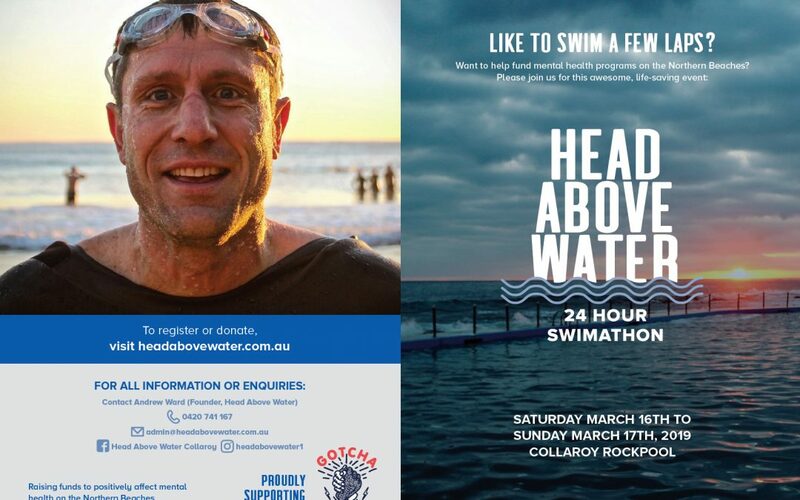 A 24-hour swimming event held at the Collaroy Rockpool, starting at 9am* on Saturday, March 16th and finishing at 9am on Sunday, March 17th, 2019. Swimmers pay an entry fee by registering on our website, headabovewater.com.au and booking their preferred swim time. There will be 4 lanes to cater for all levels of swimming ability. People can choose to swim as few or as many laps as they like, as long as it falls within their allotted time slot. The registered swimmer can then go onto raise money via their own sponsor page or form a team to raise even more money. The event will be manned for the duration by a team of professionals who will marshal swimmers in and out of the pool. There will also be an onsite MC to maintain the energy and positivity of the day, as well as catering, merchandise, music and of course, safety, medical and security officials. *Start time may vary depending on weather conditions. Final start time will be updated on our website closer to the event. The money raised by the Head Above Water24 Hour Swimathon will be supporting the fantastic work being done by Gotcha4Life. Gotcha4Life’s mission is to improve the mental health of men and boys throughout Australia and save lives through better connections with friends, family and community. Thanks to Gotcha4Life, you’ll be helping to fund mental health initiatives across the Northern Beaches, including Tomorrow Man and Lifeline.